WHAT HAPPENED: With three Duke defenders in his face and the game tied, Syracuse guard John Gillon launched a 3-pointer from straight away that banked in as time expired, as the Orange likely stamped its ticket to the NCAA Tournament with a dramatic come-from-behind win. Syracuse trailed by eight going into intermission, but stormed out of the break on a 7-0 run to close the gap. But it took a Gillon drive with contact on Greyson Allen to tie the game with 38 seconds, and when Allen missed a potential game-winning 3-pointer, Gillon raced up court for the dramatic game-winning shot. ANALYSIS: Riding a three-game losing streak, the Orange desperately got the win it needed to stamp its ticket to the NCAA Tournament. With wins over top 10 teams Virginia and FSU, and now Duke, Syracuse has erased embarrassing early season losses to St. John’s, Georgetown and UConn. The Orange, as has been the case all season, mounted a furious second half rally, and once again needed a buzzer beater to win the game. Gillon had a game much like this earlier in the season against NC State. 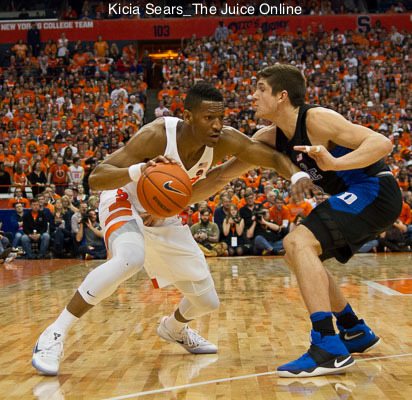 Then it was Tyus Battle’s turn on the road against Clemson. Tonight, it was once again Gillon’s turn, as the students rushed the floor for the third time this year. The two storylines of the game ended up being Syracuse’s efficient offense, as it shot 53 percent from the field and 6-11 from downtown. Conversely, Duke outrebounded Syracuse 16-4 on the offensive glass, and held a +8 margin overall. HERO: Gillon finished with 26 points and six assists, and did not turn the ball over a single time. 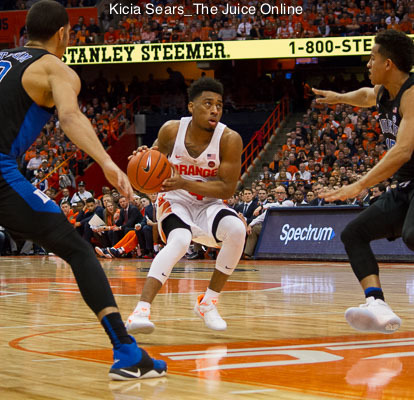 When Gillon has been at his best this season, Syracuse has been at its best. Tyus Battle also hit several key jumpers down the stretch to finish with 18. ZERO: Matt Jones and Allen combined for 3-17 shooting from the field, while Andrew White finished with a quiet seven points. 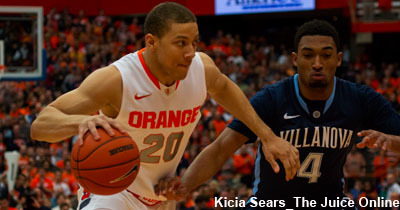 WHAT’S NEXT: Syracuse travels to Louisville on 2/26 for a 2 p.m. tip. TV: CBS.